I made a batch of sweet buns using the same bread recipe as the milk loaf. According to the original source of this recipe, the bread tastes as good when made into small buns. I filled some of the buns with red bean paste and a few with kaya spread. 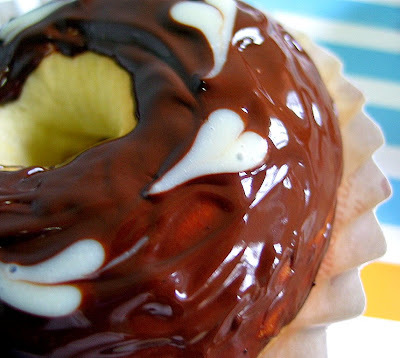 I made a few doughs into donut shapes and glazed them with melted chocolate. I don't do any deep frying at home, so, making any donuts is out of the question, even though my boys have also caught on the donut waves lately. 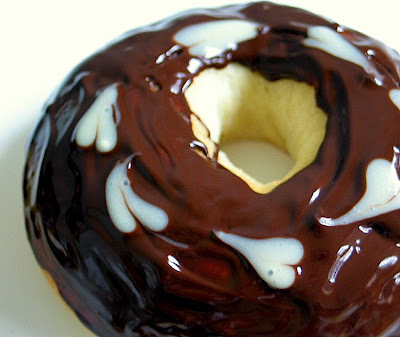 Actually the only thing they like about donuts are the sweet toppings...especially those that are glazed generously with chocolate. The chocolates that I used have got a very smooth texture, I didn't have to add any butter or whipping cream. 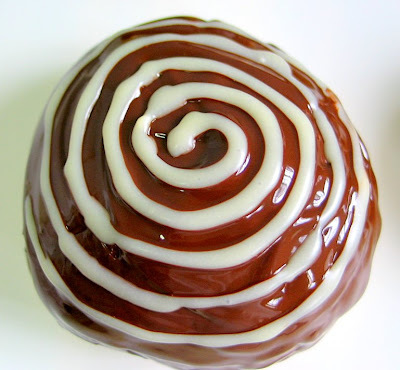 The consistency was just right for glazing. As I didn't have any white chocolates on hand, I tried melting some white chocolate chips. To my surprise, it was rather difficult to melt the chips...and it was very hard and thick, as such I had to add a few teaspoons of milk in order to get the right consistency for decorating. I didn't use a donut cutter or any cookie cutter to cut out the centre hole of the donut. What I did was quite 'primitive'! I simply shaped the dough into a round ball, and poke a finger right through the centre. Then I "spin" the dough around with a finger to enlarge the hole. It was only at this point that I realised that I had to use something to prevent the hole from closing up during the second proofing. I couldn't think of any tools to use on hand...and finally, I got out a couple of empty bottle caps and stuck it in the dough. I removed the caps just before baking, and it didn't seems to work. Once the buns were subject to the heat in the oven, they expanded and the hole almost disappeared! but I much prefer these plain ones! I prefer the plain ones too... they look so perfectly round! You have been a great inspirator to me. Thanks for sharing the yoghurt cake recipe. It was indeed really tasty. Those look like those treats you find at the Japanese bread shop (I forgot what they're called)... I love it! Will have to give it a try soon. i was looking through all your posts, and i think you're really awesome. the cakes, cookies, breads etc. look really gorgeous! Beautiful buns. 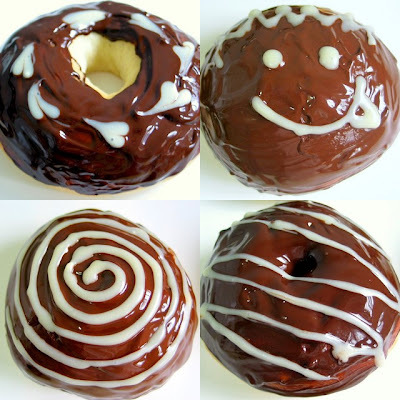 I'd take the plain, but my kids would be all over the glazed ones. I love how beautifully you decorate! The buns looks sooooo perfect, i believe they are yummy. Can I ask whether you use a Kitchenaid or breadmaker to do the dough. I am thinking of either but haven't decide yet..
Hi, I went into your flickr to see the bakes that you did. OMG.... you are so good especially in decorating and all your cakes makes me drooling. You're really a person with so much patient to do it. You're making me hungry!! 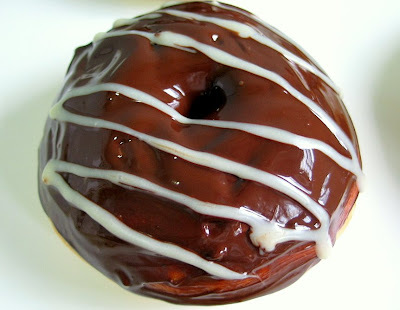 Your doughnuts look way better and tastier then the real thing! and much healthier too! The presentation is gorgeous! I especial love the heart! wow!! those look so great. i love the designs, especially the hearts. looks so yummy! Hi Sue Sue, thanks for your compliments :) I am just fortunate to have more spare time to play around and experiment with baking. dear Ellena, thanks for your encouragment...it means alot to me! 你也要加油! love your bun idea! i had always wanted to try out milk/bread hokkaido milk bread (what is the difference between the two, by the way?) but as I had previously mentioned (i think), my oven has dreadful uneven heating problems, such that I can't make loaves of bread. i don't know why i never thought of making bun versions! i was wondering if you altered the original recipe at all, in making this petite version? for eg, does the proofing time/baking time need to be reduced, and by how much? also, do the buns stay soft the following day, like the loaf version, or would they be harder, due to the higher crust-inside ratio? Hi Jo, the milk loaf does not use any whipping cream as compared to the hokkaido milk loaf. The difference also lies in the combination of the ingredients. No, I didn't change the recipe at all...the proofing time is the same, whereas the baking time is also around the same time, but I gadge by looking at the colour of the crust. Once they are golden brown, i will remove them from the oven. The buns remain soft the next day...however, I usuall warm them in the oven before serving...this way the buns tasted just like fresh from the oven. I have not come across the term crust-inside ratio though. I've tried a few of your bread recipe... its great. My family simply loves it. thanks very much for being so generous in sharing your recipe. Reading your blog has been my daily routine. Btw, where do you get the red bean paste ? And also can you share with me step by step on the homemade buns you make ? You may like to provide your email address and I can send you some illustrations from a cookbook which may help. I just typed a very long message to you and was almost finishing when it suddenly cleared out. Sob...must be my silly finger had pressed something. Anyway, here it is again. I am new to your blog and a try-again learner in baking. 2 days ago, I thought I could try bread making since cakes have not been as good a turn out as I hope for. Sometimes my cakes turn out ok the first try then the subsequent bakes got worse. Bread baking is so much tougher but don't know what got me to give a try. I got the recipe from a book that I had for many years but never got to try it. Bread texture didn't come up good and shape was no good :( There wasn't any explanation on bread kneading and how long. I guess I was not also not clever enough to go read up more 1st. I thought I gave myself another chance and found your blog. Your bakes are so great! I went straight to your bread section and read a little. Got a little impatient and went straight to try your Milk Loaf this mid-morning. I must say your dough recipe was great as I really good feel the difference when I kneaded the dough. The feel was so much better than when I did the 1st try from book. Thanks for the explanations and sharing, etc.. The buns just got out from oven and son was so excited. He said that he couldn't wait to eat the buns even when I was kneading. I realised that bread making didn't let me wash up too many things, as compared to baking cakes and biscuits. I don't have a bread making machine but I sure do enjoy my 2nd try of bread making based on your guides and recipe. Son loved the bread! He had 3 buns. The texture is so much softer than my 1st try-bread. So happy. 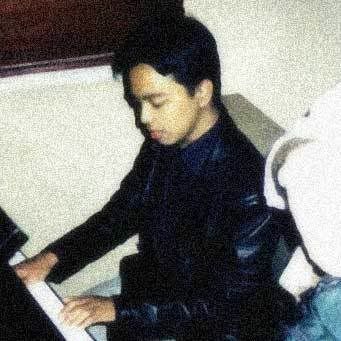 Glad that I found your blog and wished I had known you years back. Top of bun a little hard though. Any advise? Will definetly try this many times. Hope subsequent ones will improve and not be worse like my cakes. Can I ask if I can add raisins to this milk loaf recipe? Can I use those raisins that come in the fun-packs which children snack on? Can I ask what mixer do you use? Sorry side-track a bit. My mixer is a Philips. I always have this problem (mess) where the sugar, butter and flour 'fly' out all over whilst mixer is on. Kind of turned off baking cakes and biscuits as I had to clean up so much more. Sigh. Hope you could share with me if you encounter similar. Or is it just me, baking is like this? Or maybe my mixer is faulty? Hope to visit your blogs more. Tks! Hi El, thanks for visiting :) I am happy to hear that your bread buns turn out well! For the hard crust, did u cover the dough during the first and second proofing? If yes, then it could be due to your oven temp? Was the top over browned? You can add those raisins, just soak them in water, drain before use. this is to prevent the raisins from absorbing the moisture from the dough. My bread machine was spoilt a couple of years back, so I make bread less often. Wow thanks for the quick reply. Yes, the bun was kind of over browned. Will try to lower the temp next time. Oven is not a real oven, I think, something like a toaster oven type. Maybe that's the reason. Thanks for sharing on the raisin and the gadgets. Will try to work on a manual whisk next time and see if baking cakes would be manageable and enjoyable. Hi, i tried your recipe and the bun taste great. But somehow it becomes harder a few hours later. what can be the possible cause? I knead the dough longer using hand and proof it long enough, I also added bread improver. Hi, I dont use bread improver. You can keep your bread in air tight containers, it helps to prevent the buns from drying out. I m very lucky to be found your blog. 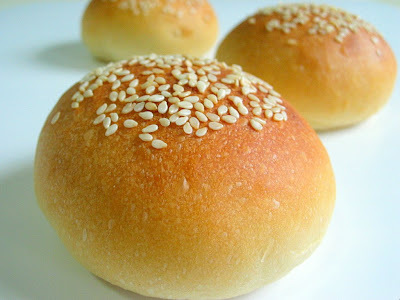 You give me a lots of new idea on making bread n buns.very happy to read your blog n copying your recipes. Thank u so much. I love baking n trying to be a good Baker. Hi HHB, your blog is wonderful and thanks so much for sharing many fabulous recipes. I made a milk loaf from your blog yesterday and it turned out amazing! Much more than I expected, it tasted as good as the ones from shops.^^. 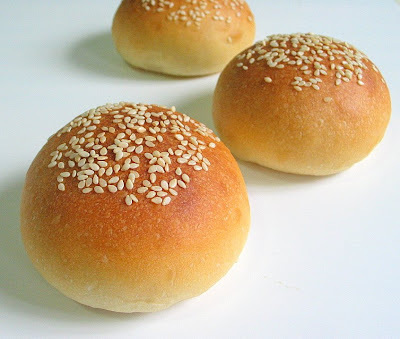 I want to use the recipe again and again but next time I want to make small buns like you did in here. I want to ask how to adjust the temperature of the oven and time of baking if I use the milk loaf recipe. Hi, thanks for your comment. I am glad to hear that your bread turn out well :) You can bake the buns at about 180~190 degC for about 12~15mins until the top turns golden brown, bake at middle rack. Hope this helps!